Recent land use changes entailed the abandonment of traditional forest practices, which genetic and ecological sustainability should be evaluated in the frame of current socioeconomic and ecological changes. The present study aimed to assess the conservation value of Quercus pyrenaica Willd. in stands subjected to two traditional rural practices, one specific (coppicing) and the other generic (maintenance of open parklands), and their effects on genetic diversity and clonal structure in this singular root sprouting oak at the southern limit of its distribution. Genetic diversity measures of seven nuclear simple sequence repeat markers were compared, and Hardy–Weinberg disequilibria were tested to be originated from recent population demography. 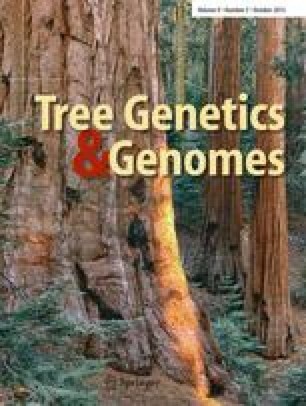 Results showed that, regardless of forest structure, the degree of clonality was very similar (∼60 %), being allele and lineage density proportional to stem density. Nevertheless, evenness of clonal distribution was higher in coppice, suggesting more homogeneous management than in open woodland. Contrary to previous beliefs, coppice stands do not involve genetic diversity losses; rather, the process of forest conversion into open woodland leads to the removal of numerous genetic lineages and low frequency alleles. The ancient presence of Q. pyrenaica in the region, which constituted quaternary glacial refuge, may contribute to its high genetic diversity. Historical vicissitudes in this anthropogenic deforested territory remark its resilient character; based on a specific fire pre-adaptive trait, continued coppicing fostered the preservation of its natural genetic diversity. This study evidences the importance of the integration of molecular and historical approximations to assess the genetic and conservation status of a secularly profited woody species. We are grateful to Elena Zafra Felipe for her inestimable help in laboratory works. We also wish to thank C. Collada, Z. Lorenzo, and C. Otero for assistance with field work. The authors would like to thank the anonymous reviewers for their valuable comments and suggestions to improve an earlier version of this paper. This work was funded by the OAPN/030/2007 project. Data from Valsaín coppice was funded by CAM P2009/AMB-1668 project and OAPN Prop23/10 JD/pl contract.